Love this print! 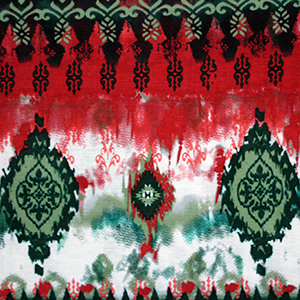 Tie dye in red, greens, and coral with a large scale and smaller scale ethnic emblems in tones of green on a white cotton jersey rayon blend knit. Fabric has a soft hand, nice stretch and drape, and is light weight. Biggest emblem measures 8 1/4" for scale.